This mod has been tested with Strike Fighters 2 Full 5 merged install; it should work with individual installations of SF2V and/or SF2NA. Cockpits (not included) required in order to make the A-6 flyable. Note: more screenshots available here. Version 1.51 can be installed directly over version 1.5. 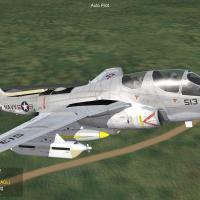 I have always loved the A-6 Intruder, and I was disappointed to see that the A-6 was not flyable by default in the SF2 series. Having been inspired by MigBuster's A-6 CCIP mod, I extracted the A-6A cockpit from WoV and started an A-6A campaign in SF2V. One thing led to another, and now I present a package that should greatly enhance your Intruder experience, or at the very least provide more variety in campaigns. Enhanced aircraft profiles for the loadout screens. Additional decals, to include Modexes on flaps and historically accurate BuNos on the tails. More historically accurate (though not organizational specific) decal size and placement for different A-6 variants. Enhanced squadron logos for many squadrons, including VA-65, VA-75, VA-85, and VA-196 (H/T Wrench for VA-75). Added landing lights, pylon lights, and ventral anti-collision lights to models and skins (anti-collision lights optional on pre-TRAM variants). Further LOD enhancement, to include proper relative placement of Pilot/BN, upgraded ejection seats, and the use of USN pilot LODs. Enhancement of Avionics, Data, and Loadout files for each variant, with particular emphasis on RWR and weapons capability. Enhancement of MigBuster's "DIANE" CCIP mod for the A-6, with improved bombsight/fall-line graphics and compatibility with March/April 2012 patches. In addition, this mod adds the A-6B and the A-6E_90, commonly known as the Systems/Weapons Integration Program (SWIP). SWIP Intruders in SF2 have a TEWS and are capable of carrying Guided EO missiles such as the AGM-65 Maverick and AGM-84E SLAM in addition to their standard loadout. 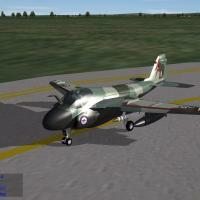 The A-6E_90 is listed in-game as the A-6E Intruder (TRAM 90) to keep the acronyms to a minimum. The default A-6E TRAM was renamed A-6E Intruder (TRAM 79). 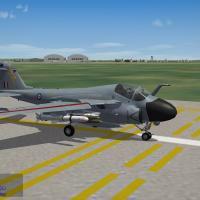 This mod enhances default aircraft. If you don't have the default A-6 LODs, or if you prefer to use a different set of A-6 LODs, then this mod is of limited value to you. Don't expect specific organizational insignia or logo placement. I tried to be historically accurate, but since these are skins designed to be compatible with all A-6 squadrons, organizationally specific markings cannot be supported. Likewise, squadron insignia change over time, and the limitations of using the default decals prevent this evolution. Variation between organizations is best represented by subtle differences between skins assigned to the same A-6 variant (e.g. the A-6E with the white/grey nose may look slightly different than the one with the tan nose). Finally, the Superpack is unfortunately not flyable without further modification. You will need to provide your own cockpit in order to enable player use of the A-6. The Superpack is divided into three sections: the Primary Components, the Campaign Mods, and the Optional Mods. There is also a folder for widescreen users that replaces the existing 1024x768 aircraft and campaign screens with 1440x900 images. This includes decals, weapons, and an updated SQUADRONLIST.INI. Copy the contents of this folder first. This includes the A-6A and A-6B. Copy the contents of this folder if you have SF2 Vietnam installed, as it requires the 3W A-6A LOD. This includes the A-6E, A-6E_79, and A-6E_90. Copy the contents of this folder if you have SF2 North Atlantic installed, as it requires the 3W A-6E and A-6E_79 LODs. This now includes Wrench’s skinpack by default (was an optional component pre 1.5). These files modify the existing campaigns other than Vietnam or North Atlantic (which were included in the primary components). This is a slightly modified version of malibu43’s SF2 campaigns that integrate naval operations into the Desert theater. In addition to adding the A-6, the campaigns add other USN/USAF aircraft of the period. There is also an additional 1979 campaign called Desert Blaze, which adds the later hardware from SF2E and SF2NA, as well as incorporates Wrench’s F-111B Fleet Defense Fighter for people who have it installed. The original SF2 campaign updates require a full 5 merged install. This adds the A-6 to the original SF2E campaigns dated at least 1963. 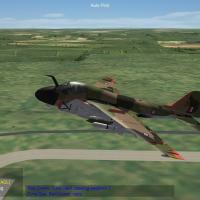 The campaigns add two USMC A-6 squadrons to the NATO side, as well as the requisite number of Su-7s to the OPFOR. You should have at least SF2V and SF2NA installed with SF2E before adding the SF2E campaigns. Copy these folders if you have a widescreen monitor. 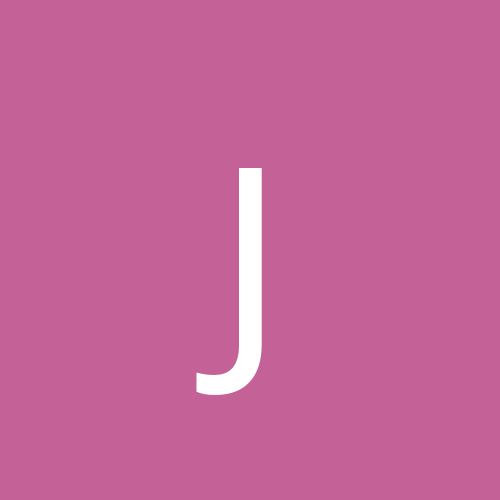 These folders should be copied after all desired optional campaigns have been copied over, as this will overwrite campaign graphics as well as aircraft hangars and loadscreens. 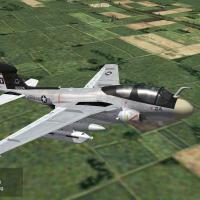 These are tweaks to the A-6s themselves, and are here to personalize and enhance your gameplay. Copy the contents these folders to your SF2 “Mod” folder. Order is not important, but some of the mods directly conflict with others and will not work properly if “stacked.” Using conflicting mods requires manual datafile manipulation which is covered in Section 5 (Manually modifying Data INI files). Compatibility issues are noted in each section. This mod limits the player-selectable USN modexes (side numbers) to 500-524 (400-524 for experimental green skin, per historical record), and USMC modexes to 00-24. I did this by making adjustments to the TEXTURESET.INI file. This does not appear to affect the modexes selected by the Campaign generator. This mod has no compatibility issues with the other existing optional mods. The original A-6A did not have rotating anti-collision lights, as the first production aircraft pre-dated the FAA mandate for anti-collision lights in controlled airspace. To comply, the Navy and Marine Corps added a tail light (already modeled in the LOD), and for the ventral light they attached a light to the starboard side of the nosegear door. However, the lights were easily removed and pre-TRAM A-6s often flew operationally without them. This mod allows you to remove these anti-collision lights. 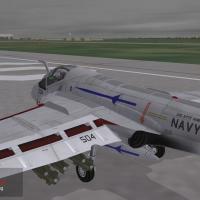 This mod should not be used with the A-6AB Flare Dispensers mod or the Robo-BN mod without manually modifying the A-6A_Data.ini and A-6B_Data.ini files. 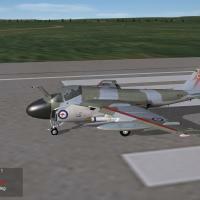 This mod puts flares on the A-6A and A-6B. Original specifications called for only chaff, but Vietnam late war doctrine often called for the dispenser loadout to be one flare for every two chaff packs (as was documented in Stephen Coont’s Flight of the Intruder). This mod is highly recommended with the SF2E campaigns, as the A-6A would have likely been fitted with flares for a theater with such a heavy CAS role and increased air threat. This mod cannot be “stacked” with the Pre-TRAM Anti-Collision Light Removal mod or the Robo-BN mod, but requires manual modification of the other mods instead. Due to the additional interior cockpit detail of the RAZBAM series of A-6 cockpits, this mod is incompatible with the RAZBAM cockpits. This mod cannot be “stacked” with the Pre-TRAM Anti-Collision Light Removal mod or the A-6AB Flare Dispensers mod. 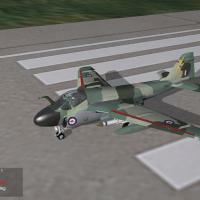 You may notice that the A-6 as of version 1.2 plays quite differently from the A-6 in previous versions. This is due in large part to malibu43’s outstanding research and contributions. 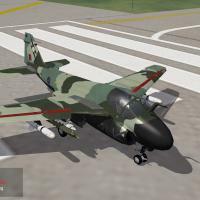 For version 1.2, we have updated the weapons capabilities of all A-6 variants, removing E/O capability from the A-6A but adding the AGM-12C visually guided missile. Likewise, we added the restrictions on interior hardpoints and adjusted the Loadout files to reflect this, adding the large bomb loads to exterior pylons (and for the record, we did this prior to the May 2012 patch!). We researched historical loads and added them to the loadout files, and found that we needed to tweak some datafiles to make them work. Malibu43 tweaked the Rockeye and SnakeEye datafiles to provide proper quantities to units, and created a custom MER to allow for three Mk83 bombs to be mounted two in front, one in rear per historical procedure. I made every effort to accurately represent the subtle changes between A-6 variants commensurate with their periods of operation. Additionally, I used actual A-6 BuNos (serial numbers), with independent BuNo pools for the A-6A, A-6B, and A-6E (TRAM variants use the A-6E pool). 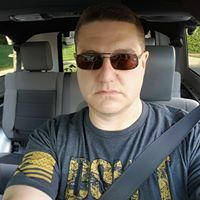 I have made every effort to avoid using BuNos of aircraft involved in mishaps involving fatalities, or combat losses resulting in KIA/MIA/POW. However, if I missed one that you catch, please let me know so that I can fix this in the next release. Likewise, if you have recommendations for object or detail placement, I would love to hear them. Finally, while I made adjustments to a number squadron logos and added four additional squadrons, I don't have the time to improve the entire collection. If there is a logo you would like, please post a flat image (like a decal) so that I can directly convert it. Likewise, if you improve the logos or create your own, please submit them so that I can include them in a future release. Full credit will be provided. Malibu43 was a major contributor for version 1.2, adding campaigns, custom loadouts, and custom weapon data to allow for historical employment. His research and contributions were many, which is why he is co-credited in this release. 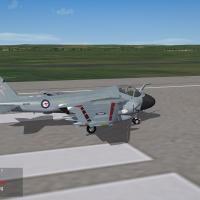 I also received help from Wrench, and likewise used some of his skins, A-6E_79 avionics files, and templates. A big thanks goes out to Wrench. Likewise, Wrench's A-6E TRAM Skinpack and his TRAM VA-75 skin has been included for both TRAM variants, and has been converted for use with the A-6E. VA-42 and VA-128 logos have been converted for default use from these skins. 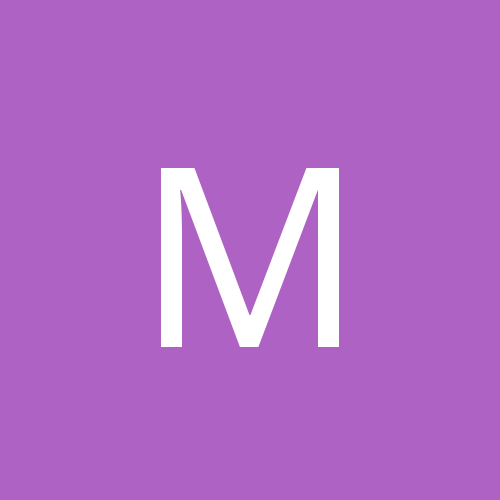 Original readme files and screenshots can be found in the Extras folder. Ventral and Pylon Lights were created by RussoUK2004. VAQ-134 decals are by Dave from his VAQ-134 EA-6B. the A-6B, so thanks goes out to Malibu43 & eburger68. 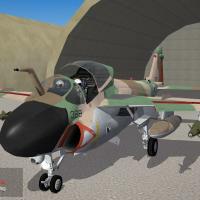 Weapons included in this Superpack have been copied from Spectre8750's A-10C, FastCargo's F-15 Superpack, SF2V Air & Gound Expansion Pack by Malibu43 & eburger68, and the F-14 Superpack from The Mirage Factory (TMF). NAVYNM2 and MODUSN2 Pilot LODs taken from the TMF F-14 Superpack. The Martin-Baker Mk5 ejection seat is the Mk4 ejection seat by TMF with updated textures. TireTouch.wav was taken from FastCargo's F-15 Super Pack. FansongTrack and FansongLock WAV files (A-6A/B/E RWR sounds) by Fubar512. USN Wind, Stall, and engine overspeed sounds taken from the TMF F-14 Superpack. 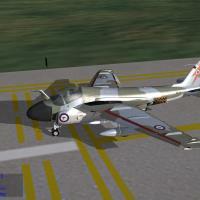 Classic A-6 skin patterns are based on the default 3W A-6 skins by DanW. Red Lightning campaign start graphic is taken from a review screenshot of “Wargame: European Escalation” in accordance with the FAIR USE Act. 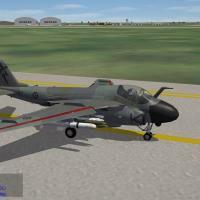 Cockpit textures for the A-6 LODs were extracted from A-6 Intruder Walk Around by Lou Drendel, and from online screenshots of the RAZBAM A-6 cockpits for FSX in accordance with the FAIR USE Act. A-6 Intruder Walk Around by Lou Drendel and A-6 Intruder In Action by Joe Michaels were both used extensively for research on proper markings and placement. Some of Lou Drendel’s outstanding artwork also found its way onto hangar screens and loadscreens. 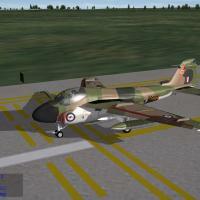 This Superpack is released in accordance with the Combat Ace Freeware Licensing Agreement. Please feel free to use the contents of this pack with any other mod, so long as appropriate credit is provided. 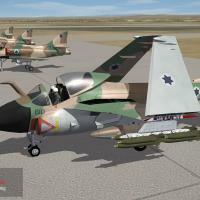 For support, please post in the File Announcement thread for this mod at Combat Ace. Added AGM-88A and AGM-88C and revised start date for AGM-88D. Revised weapons loadouts to account for AGM-88A/C.